This captivating sofa will bring classic elegance into a contemporary interior and make an unconventional choice with traditional decor. Part of the Louis XV Goes To Sparta Collection by Maurizio Galante & Tal Lancman, it is inspired by the idea of combining the austerity of marble with ornate French design and will not go unnoticed. The plywood frame, padded with CFC-free polyurethane foam shaped from a multi-density block lined with Dacron, is entirely covered with fabric (32% silk, 68% polyester) that showcases a Carrara marble photographic print. 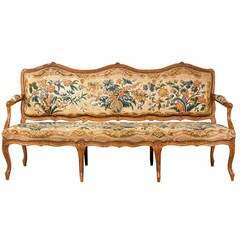 Louis XV period beech frame sofa, the multi serpentine shaped fronts well carved with floral emblems upholstered in a good 19th century tapestry specially woven. RR. 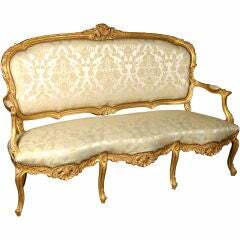 Beautiful satin damask upholstered, ornately carved Louis XV settee, with nailhead trim. Good vintage condition, needs to be upholstered. Sold as is. 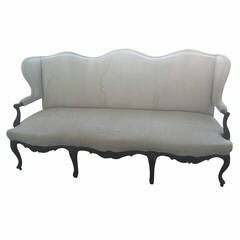 Antique Louis XV style French sofa canapé. This is a perfect piece to restyle by maybe gilding or painting the gorgeous carved frame and reupholstering. Gorgeous antique French, Louis XV sofa. It's attributes include a wingback top, dark wood finish, gorgeous carving and 19th century grain sack cloth upholstery.